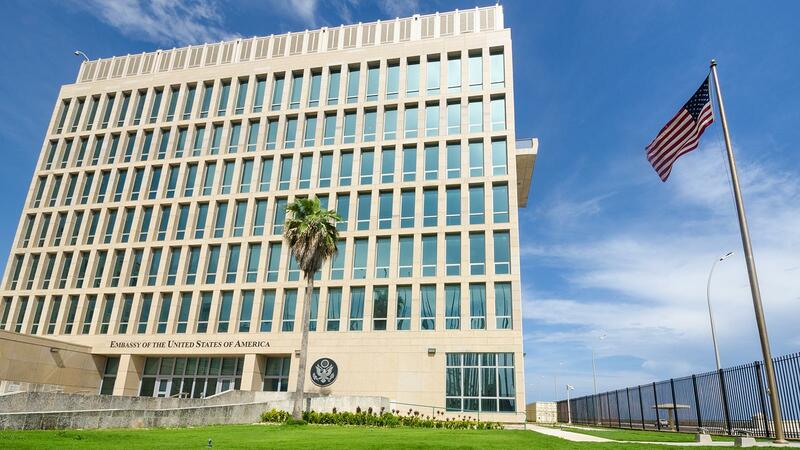 The U.S. Embassy in Havana, where unexplained health problems experienced by personal caused the State Department to issue a travel alert. The State Department today upgraded its travel alert on Cuba, dropping its previous advisory of “avoid travel” and instead recommending that travelers “exercise increased caution” when visiting the island. The recommendation comes in the wake of the still-unexplained health problems experienced by U.S. embassy personnel over a year ago in Havana. Cuba now holds a Level 2 ranking, joining European nations such as France, Germany and Italy, which are also in the Level 2 category. The Trump administration issued its first travel alert last September when then Secretary of State Rex Tillerson announced that the U.S. Embassy in Havana would be reduced to a skeletal staff. The consulate was also closed in response to unexplained cognitive problems suffered by U.S. personnel who reported some kind of acoustical pressure before falling ill. The first four individuals stricken were reportedly CIA operatives, leading to speculation that the acoustical phenomenon was part of a spy-vs-spy surveillance campaign gone awry, or a harassment campaign in the aftermath of President Donald Trump’s election. "We have no reports that private U.S. citizens have been affected, but the attacks are known to have occurred in U.S. diplomatic residences and hotels frequented by U.S. citizens," Tillerson said in a statement advising against travel. "The Department does not have definitive answers on the cause or source of the attacks and is unable to recommend a means to mitigate exposure." In a January 2018 report that remains classified, the FBI ruled out “sonic attacks” as the cause of the health problems. But various U.S. agencies remain involved in a major effort to determine the source, and circumstances, of the injuries that affected over two dozen U.S. personnel. Secretary of State Mike Pompeo recently ordered the creation of a special task force to coordinate the ongoing investigation. The travel advisories have had a significant impact on the number of U.S. visitors to the island, which reached a record 620,000 people in 2017. “The number of Americans—not counting visits by Cuban Americans—fell 56.6 percent during the first three months of this year compared to 2017,” the Miami Herald reported in June. Hardest hit by the drop-off in travel has been Cuba’s developing private sector—owners of private restaurants, AirBnB rentals, taxi drivers, tour guides—who have catered to American tourists flocking to the island after the historic rapprochement orchestrated by President Barack Obama and Raul Castro in December 2014. “We are pleased that the State Department has made this common-sense decision,” stated Martha Honey, executive director of the Center for Responsible Travel (CREST), which has coordinated advocacy efforts to press the State Department to upgrade the travel advisory.